build the products you love. How to effectively build products with your intelligent Kanban Board. Blossom is built with you in mind whether your team is in the same room, distributed over different floors, different cities or even continents. Invite marketing, sales, business development, customer support and every other involved stakeholder to collaborate directly with engineering, user experience & design. Bringing the skills of every individual together on the same page gives the ability to move and ship faster. 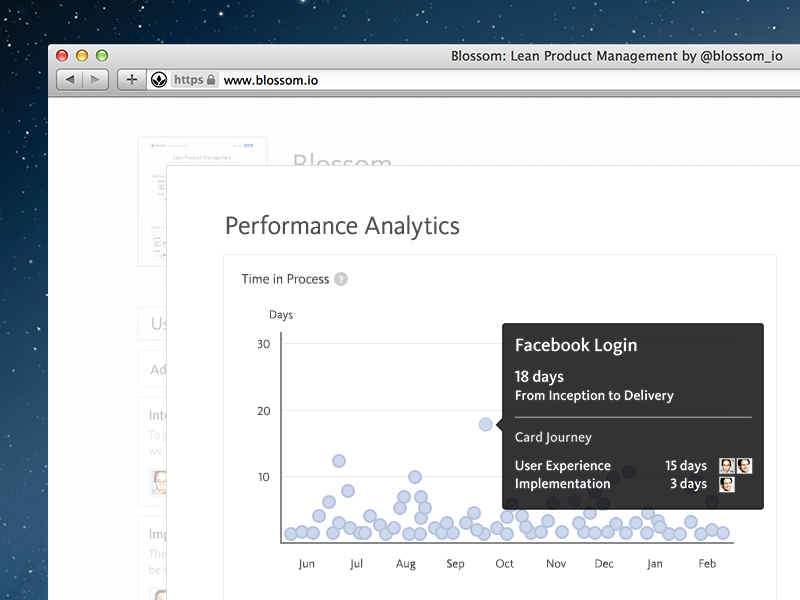 See the status of the work being done at a glance by visually representing each stage of your process flow in a Blossom Board. To create your workflow you first identify the major processes of your department or organization and then map them to a Blossom Board. You can identify them by simply determining “Where do features come from and where are they going next?”. 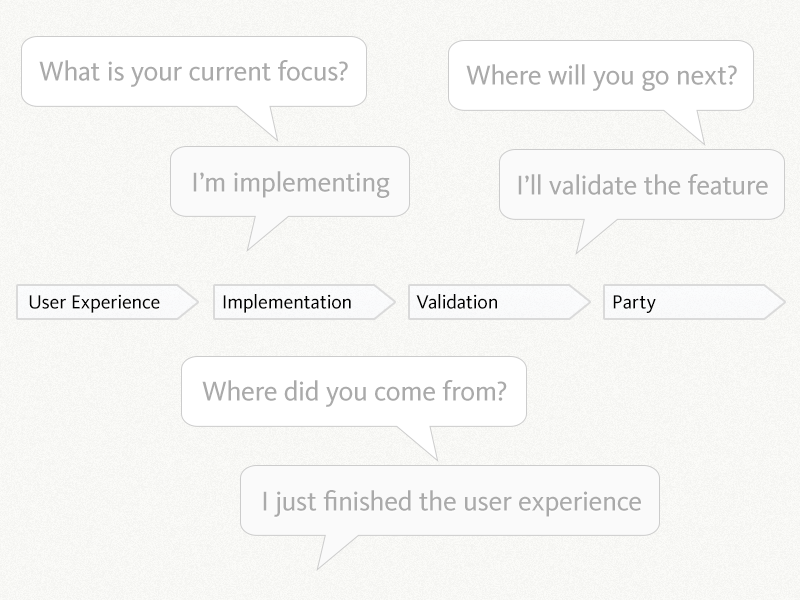 The initial stages of a workflow on a Blossom Board are User Experience > Implementation > Validation > Party. Add, edit or remove stages to visualize your Workflow to match your project’s needs. Map your entire software development workflow in Blossom Boards to get overview about who is working on what and most importantly why. Start by adding Cards that represent features which are worth doing. Cards have a short title that everyone in your team can recognize and understand. Each card shows the reason why it is being built, who is currently involved and an optional state, for example if it is "Blocked" or "Ready for the next Stage". By doing this work gets visible to all involved stakeholders, collaboration and communication increases instantly and you are able to easily identify blockers, bottlenecks and things that slow the delivery to the customer down. Reduce the time a card takes to go through from the first to the last stage by adding card limits to stages of the board in which work is being performed. Setting the optimal amount of work that your team can handle at one time will lead to a smooth & continuous workflow and it improves quality because you can give greater focus to fewer tasks. These benefits improve efficiency and you eventually get more work done in less time. In a push system finished work gets “pushed” to the next step in the workflow. 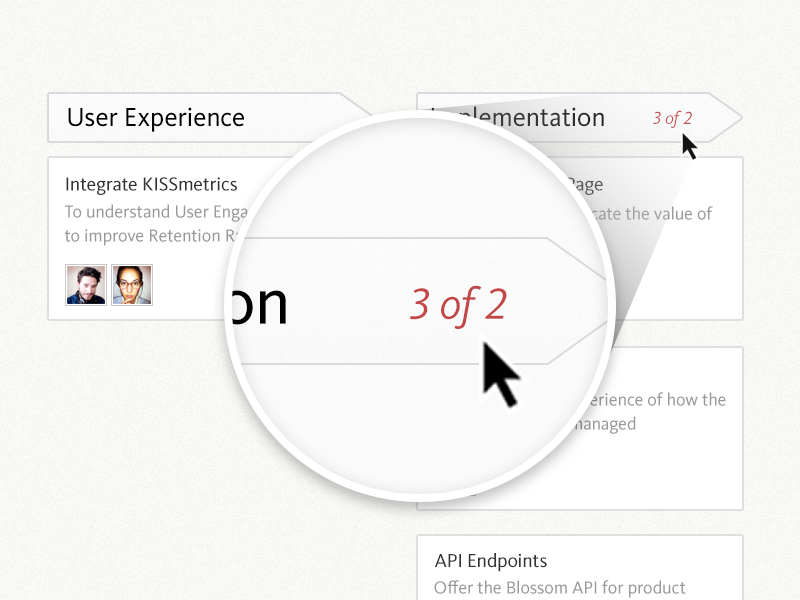 Whereas in a pull system — like Blossom Boards — work gets “pulled” from one stage to the next when there are open slots available. So when a team member is ready to start to work on something new, he or she pulls a new card into the appropriate stage on the board. Pulling work leads to flowing work smoothly through the board and leads to higher quality products. 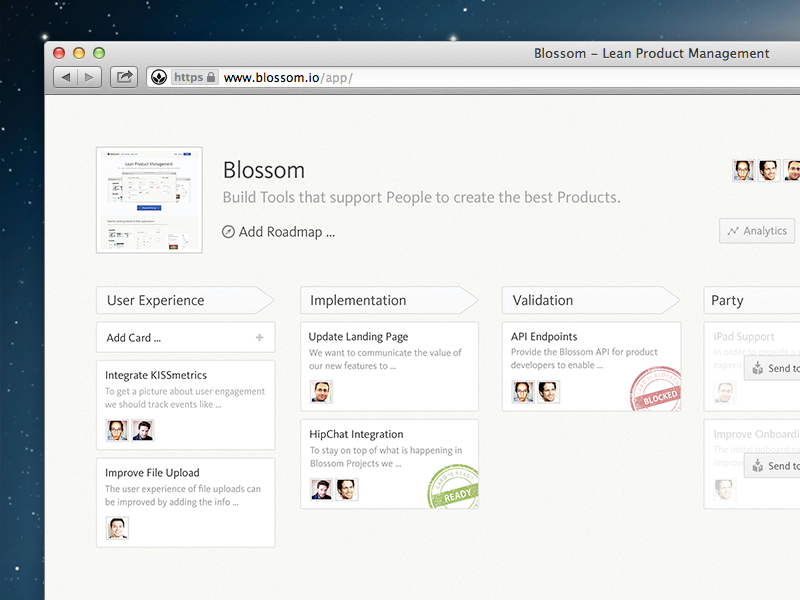 Managing your work with a Blossom Board shows how work is flowing through your development process. Measure and analyze the performance of your flow with our in-depth tools like the Cycle Time of Cards, the Time in Process Chart, the Table of Outlying Cards and the Cumulative Flow Diagram (coming soon). The automatically generated metrics help you to prevent future problems and provide you the information you need to optimize your current flow and maximize efficiency. A powerful way to drive improvement and to get a better feeling for the performance of the flow are regularly held standup meetings. “Standups” received their name because teams meet and gather around the board while standing. To emphasize the pull system you “walk” the stages of the board from right to left. Observe while going through the board: Do the cards flow through the board smoothly? Are there any blockers? 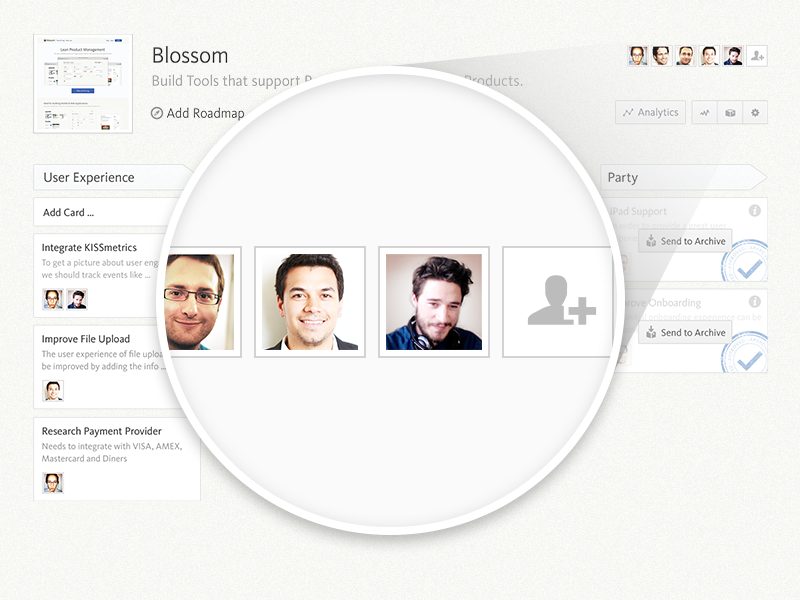 The “Standup” is a powerful tool for open collaboration and transparency in teams.